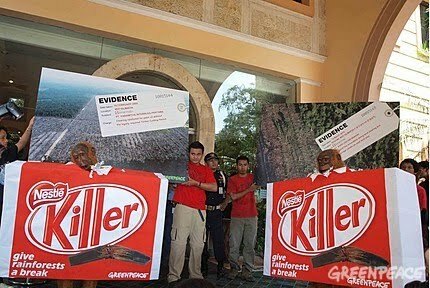 Jakarta, Indonesia — Greenpeace activists dressed in orangutans costumes held a protest at Nestlé’s Jakarta headquarters to demand that the manufacturer of Kitkat, cut all ties with forest destroyer Sinar Mas group, including through third party suppliers like Cargill and IOI (Loders Croklaan). 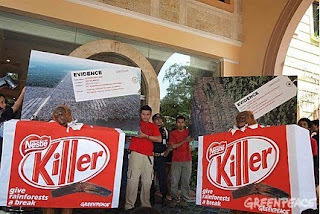 Last week Nestle cancelled a direct palm oil contract with Indonesia's biggest peatland forest destroyer Sinar Mas following the release of the Greenpeace report ‘Caught Red-Handed'. (1) The report reveals how Nestle is sourcing palm oil from suppliers like Sinar Mas, which continue to expand into carbon rich peatlands and rainforest that is critical orang-utan habitat. "Nestle's cancellation of the direct contract with Sinar Mas is not enough.It must stop buying Sinar Mas palm oil and pulp products from third-party suppliers like Cargill and IOI as well. Nestle has the influence and responsibility to clean up the entire palm oil supply system, saving the last remaining home of the orang-utan and helping to stop the acceleration of climate change through Indonesian deforestation." said Bustar Maitar, Greenpeace Southeast Asia forest team leader. Indonesia currently has the fastest deforestation rate of any major forested country in the world. The destruction of its tropical forests for palm oil and pulp and paper industries is an ecological disaster and a leading contributor to Indonesia's greenhouse gas emissions, making the country the third largest greenhouse gas emitter in the world after China and the USA. Over the last half century, over 74 million hectares of Indonesia's forests -an area more than twice the size of Germany - have been logged, burned or otherwise degraded. "Greenpeace is not against the palm oil industry, our campaign is to stop companies like Sinar Mas from destroying the last remaining rainforests of Indonesia. Greenpeace supports President Yudhoyono's commitment to reduce Indonesia's greenhouse gas emissions by 41% with international help. Halting forest and peatland clearance and stopping companies like Sinar Mas is the only way to achieve this," Maitar said. Greenpeace is calling on Indonesia's President Yudhoyono to declare an immediate moratorium on deforestation as it would provide the space for the implementation of longer term measures for forest protection supported by international donors. Such a moratorium would also drive investment and other related policies into both yield improvements on existing plantation areas, especially those owned by smallholders, as well as the development of plantations on non-forest areas.